The 2017 Honda CBR1000RR Fireblade is a most technologically advanced version of the motorcycle to date. A slew of mechanical and electronic upgrades have brought it on par with the new generation liter-class superbikes. While the design philosophy is similar to the previous bike, the lines have been revised to improve airflow. It gets all-LED headlamps and an adaptive TFT instrument console, which automatically adjusts brightness according to ambient light. The 999cc inline-four engine develops 190bhp and 114Nm of torque. It is mated to a six-speed transmission with slipper clutch. The new frame and other weight saving measures have helped the new ‘Blade shed 15kg over the outgoing model. The electronics package includes nine-level adjustable traction control, a Bosch ABS system, rear lift control and wheelie control, with the feedback coming from a five-axis IMU. There are three riding modes – Track, Winding, and Street. 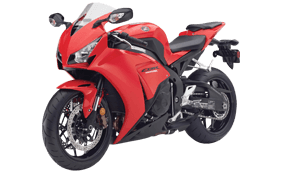 The CBR1000RR Fireblade is offered in two colors – red and black. It competes with other superbikes like the Kawasaki Ninja ZX-10R, Suzuki GSX-R1000, BMW S1000RR, Yamaha YZF-R1 and the Aprilia RSV4. As per Honda, this bike does 0-100km/hr within three seconds and that makes it the fastest bike in CBR series. Honda has mated this extremely refined engine with perfect gear ratios. It has an incredible throttle response which needs experience for its controlled and safe usage. The bike is designed for power and speed and it’s quite clear from its very first move. Crossing the speed mark of 150km/hr is like a cake walk for this bike. When you drive it then you will get to know why it’s been named Fireblade. Every part of this machine seems to be roaring for power and speed. 2017 Honda CBR1000RR looks glorious from every angle. Honda has done almost everything, what it takes to make an appealing sports bike. The front fairing is the most eye-catching thing in this bike which also houses sleek LED headlights. The V-shaped tinted visor enhances the charm of this bike. The side cowl and fuel tank feature new cool graphics which makes it look aerodynamic. Clear lens indicators are integrated into its rear view mirrors which are mounted on its front fairing. One of the classic bike by the team Honda. This is something that you must always look for. You will surely feel proud to have this bike with you. It’s a great one with lost of awesome features. Fireblade's performance has the family racing traits which makes it stupendous. Without much effort, it can cross the speed of 200km/hr and be prepared to go beyond that. There is no strain in this engine even at 11000rpm and that shows the low level of vibrations and harshness. The positive response from this engine prompts you to reach its limit. Most of the torque is used at early rpms and that helps it to get the momentum easily after every gear transition. It’s the heavy power production of this engine which makes the difference to its performance in comparison to other sports bike. There is not a specific reason to go on this bike as this bike is full of plus points. Whether it is about the looks, prices, design, and specifications. All of the things are just perfect. So you should not have a second doubt while choosing this for yourself. There is no doubt in saying that driving without a valid insurance is illegal. You must buy at least a third party liability cover to get the best version of it. It is full of safety features along with great benefits. So you should go for it otherwise you wouldn’t be able to drive legally on the roads of India. CBR1000RR Fireblade Standard Rs. 18,48,896 (Ex-showroom, Mumbai)Disc Brake, Alloy Wheels. CBR1000RR Fireblade SP Rs. 21,63,251 (Ex-showroom, Mumbai) Disc Brake, Alloy Wheels.